Vetmed USA is a company which has experience of more than 12 years, supplying economy and German grade stainless steel instruments for veterinary, surgical, dental, orthopedic, ophthalmology, as well as OBGYN markets all over the world. Vetmed USA production is characterized by high quality, because all of offered instruments go through strict inspection at every step of manufacturing process. These Vetmed USA 7.5” barber styling shears are made from ice tempered stainless steel which provide extra sharp and long-lasting cutting edges. Both of their blades have beveled edges which ensure smooth and precise cuts. Their blades are 7.5 long which are considered to be very long, because usually hairdressers do not use longer shears than 7.5 inches. Unfortunately, these barber styling shears do not have possibility to adjust the tension which helps to loosen or tighten shears, their finger rest is non-removable which improves ergonomics and comfort during hair cutting, they do not come with finger sizing rings which enhances stability and comfort, as well as they do not come with storage case for safer and more comfortable movement. These Vetmed USA hair cutting shears can be described as polished silver, because they are made of ice tempered stainless steel which is silver color and has slight, metallic sheen. Their design can be considered to be classic, because they do not have any special design elements, as well as their angles are straight and simple. As one might guess, these Vetmed USA shears are intended for grooming, but, of course, they can be used for hair cutting as well. These barber styling shears are suitable for such hair cutting techniques as slicing, chipping, pointing and blunting. As they are quite qualitative and their price is low, they are suitable both for professional and amateurish usage. 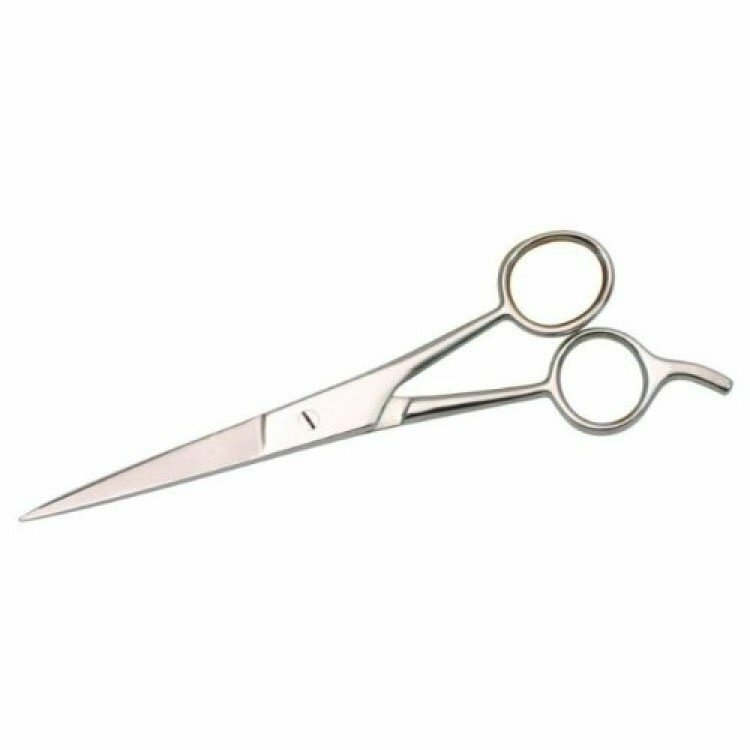 These Vetmed USA 7.5” Barber Styling Shears are made of ice tempered stainless steel and their blades have beveled edges. These hair cutting shears are 7.5 inches long. As they are made of stainless steel, their design can be described as polished silver. These Vetmed USA scissors do not have tension adjustment possibility, finger sizing rings, as well as storage case, but they have non-removable finger rest. This Vetmed USA product is suitable both for professionals and students. These shears can be used for hair cutting techniques such as slicing, chipping, pointing and blunting.